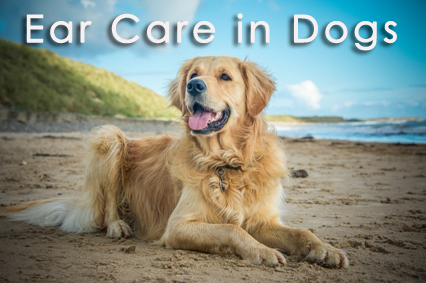 Maintenance of dog’s overall health is essential for his entire life. Starting from his skin care, oral care, maintaining joint health to ear care, everything has to be taken care of in order to provide him a long and healthy life. Well, when it comes to ear care, it is important to keep them clean and healthy. Dog’s ears are little tricky, as they are not as straight as human ears. Because of twisty, curvy design of inner ears, it is easy for mites and parasites to hide and breed in them. This also means that debris accumulated in the canal cannot easily get itself out. The trapped debris also results into infection. Moreover, dogs with allergies suffer more due to floppy ears and are infected too quickly. This makes it necessary for dog ear care. For your dog’s general cleaning and maintenance routine, you should include regular ear checkup. This is especially more important for those dogs who produce more earwax or have a lot of inner ear hair. If you find that your dog’s inner ears appear dirty, clean them with a cotton ball dampened with hydrogen peroxide or mineral oil which is formulated for this purpose only. Inner-ear skin is very delicate; therefore, it is important to learn proper method from your vet about how to clean your dog’s ears. Remember not to clean your dog’s ears too frequently or too deeply, which may cause irritation and ensure not to induce anything into your dog’s ear canal. If you find your dog sprouts hair from his inner canal, you or your groomer may have to tweeze it out every few weeks to control any problematic mats and tangles from forming. It is better you discuss about this problem with your vet. Moreover, you need to be more careful when your dog takes bath or swims. Frequent baths and swims can also lead to infection and irritation. In order to prevent this from happening, place cotton in your dog’s ears before giving him a bath or taking him for a swim. You need to also take care that after water sports or activities, you need to clean the ears thoroughly and safely without causing harm to inner ear. Ensure that the inner ear has become dry. In case, your dog is prone to infections, it would be good to pour few drops of an ear drying solution or some ear solutions for dogs to prevent any type of infection. Well, taking care of all these things, you can keep your dog’s ears clean and help him enjoy mite free life. « PetCareSupplies Honors Service Animals Through Memorial Day Long Weekend Sale! What You Must Know On National Pet First Aid Awareness Month? Our blogs cover a wide range of topics including nutrition, feeding and health guides. Follow our Pet Care Supplies blogs and stay updated with all the tips and tricks on how to keep your four-legged friend healthy.